This month is all about preparation for big events in October. We are collecting boxes and jugs, just beginning our apple harvest. This will bring apple processing in many forms: juicing and drying, saucing and baking. We’ve been picking plums and digging potatoes. There have been a few days of rain as relief from the unending stretch of beautiful days. 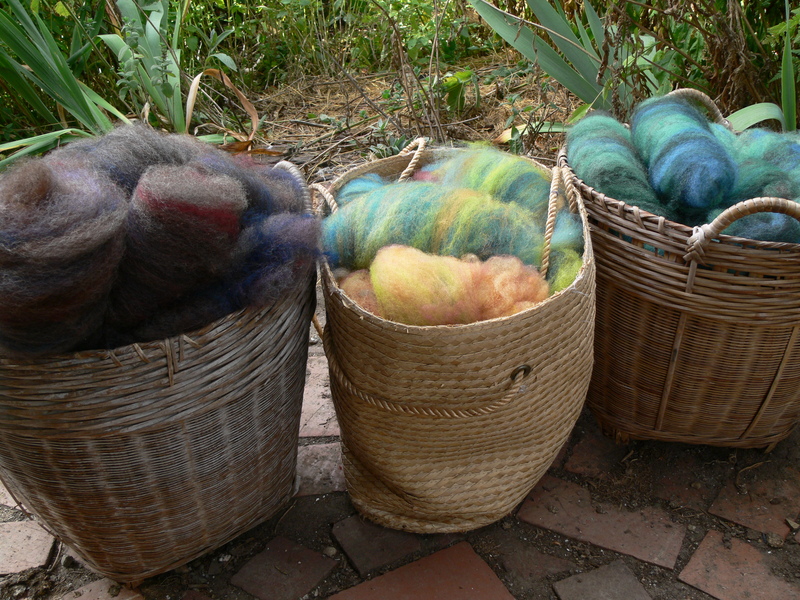 And I’ve been scouring our sheep’s fleeces and dyeing them a rainbow of colors that I’m blending for heathered yarns. It’s so fun! We are having gorgeous summer weather in the islands. The water at the beach is finally bearable for swimming, even pleasant (if refreshing) on a hot afternoon. So our thoughts and plans move ahead of us, season by season. 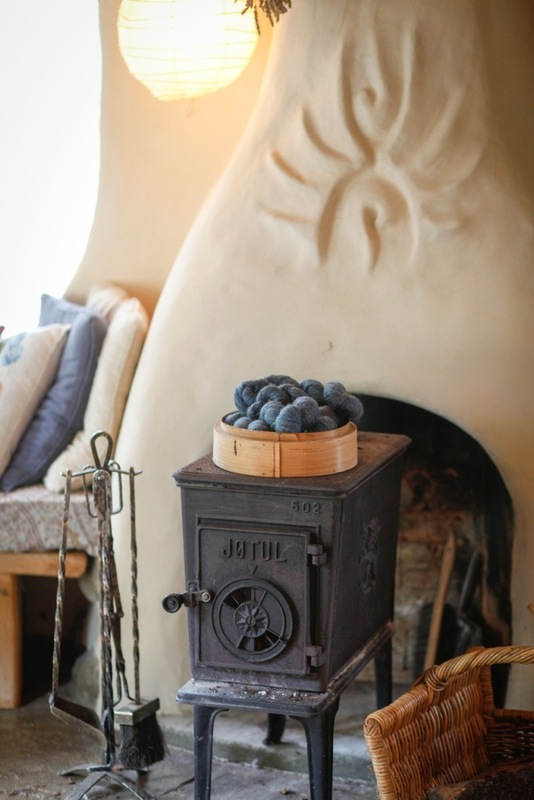 Today was the annual cleaning of chimneys, readying woodstoves for winter. I loved hearing about everyone’s summer adventures, wild and tame. I hope Amy J. enjoys summer knitting for a cozy winter. So many thanks to everyone for reading and taking time to comment. Perhaps, like chimney cleaning, this will be a regular occurrence. Where to start…….many exciting things have been happening. The boys got ducks. They’ve wanted ducks so much that they’ve been pretending the hens are ducks. 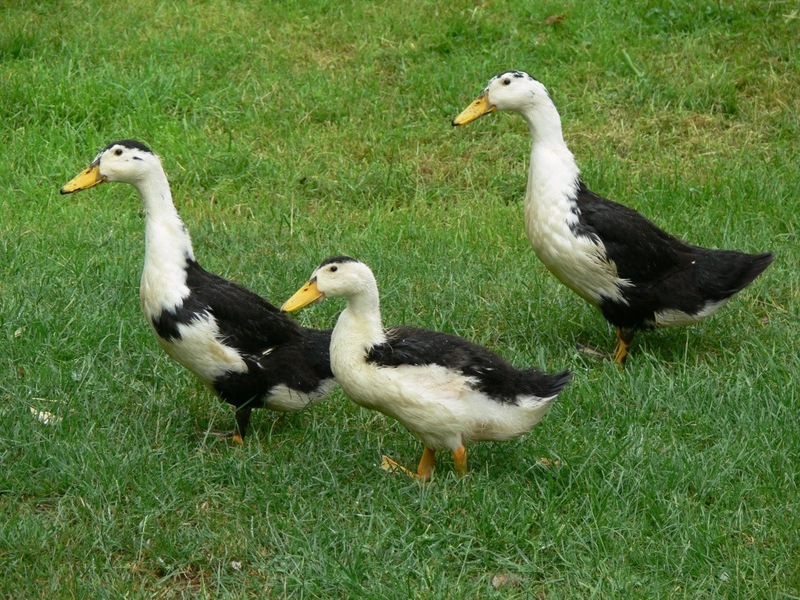 They’re Magpie ducks, a rare breed. We’re hoping at least one is a girl. 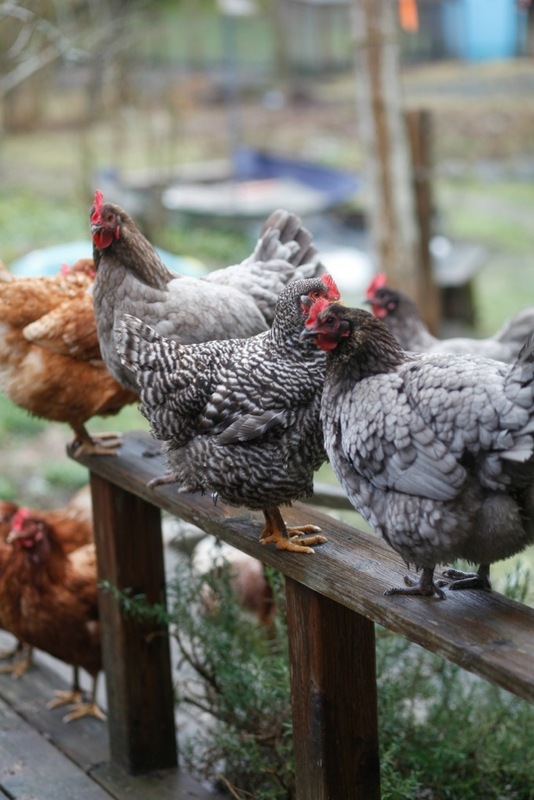 If they were all girls, that would also be fine as they are reportedly great egg layers. 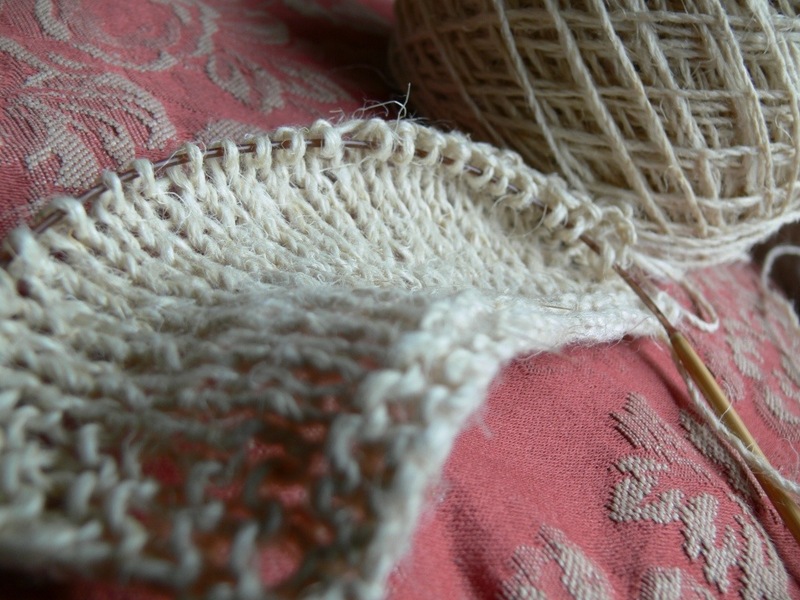 I’ve been swatching my hemp for a bast fibre sampler smock. 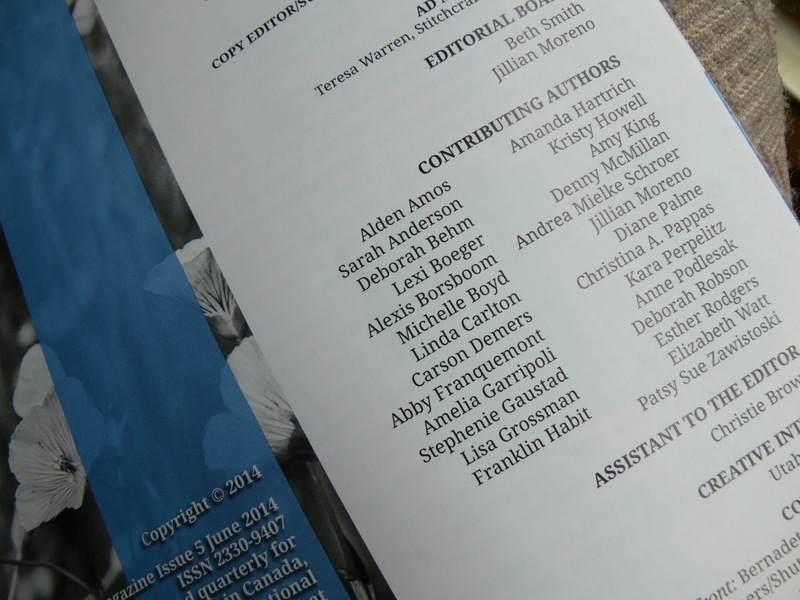 Look at that amazing list of contributors, and me! I’m still working my head around it all. 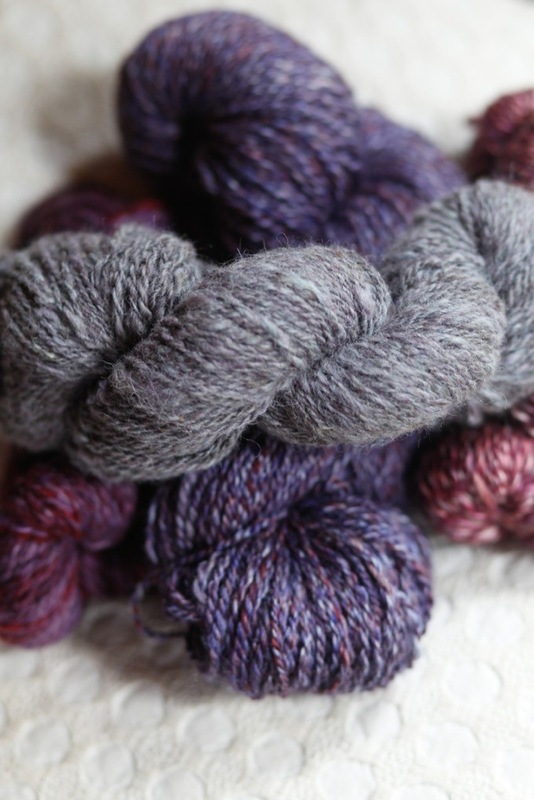 I’d like to celebrate with a giveaway of a recent favorite skein of handspun. 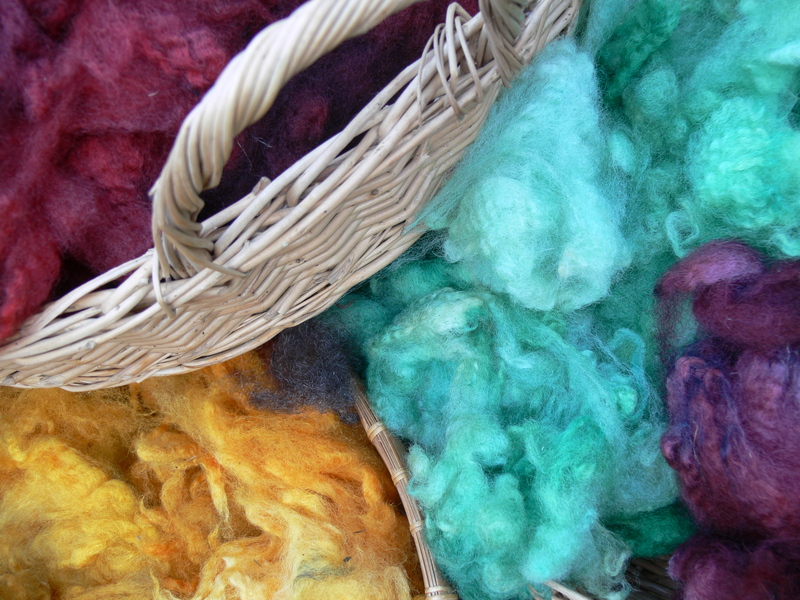 It’s 170 yards of mixed up fun……merino, mohair, cashmere, several types of silk etc. 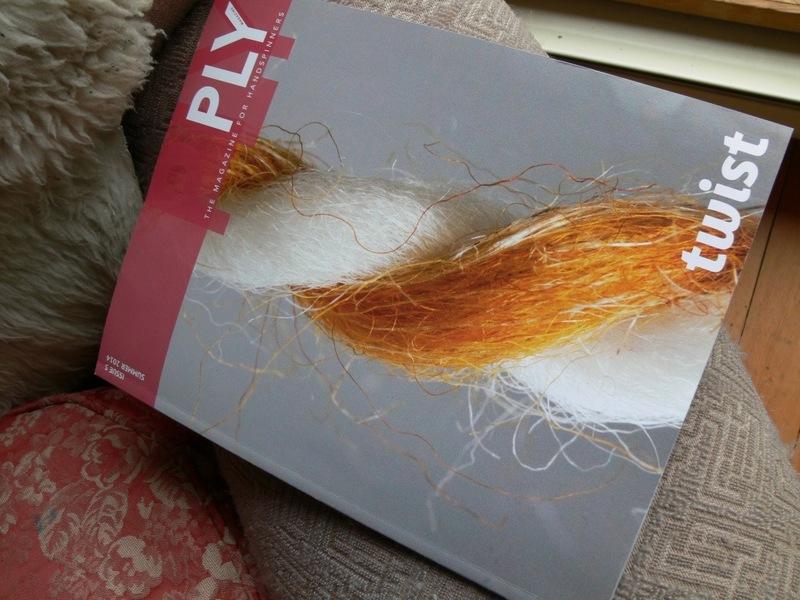 I know some folks aren’t knitters……if you’re local or visiting the island this summer, I’d happily include a knitting lesson. Otherwise, if you’re a patient non-knitter, I will knit it into a hat or cowl. Leave me a comment to enter. I’d love to hear what excitement summer is bringing you. If you follow, leave a second comment telling me how and it will double your luck. I’ll draw a winner in a few weeks. 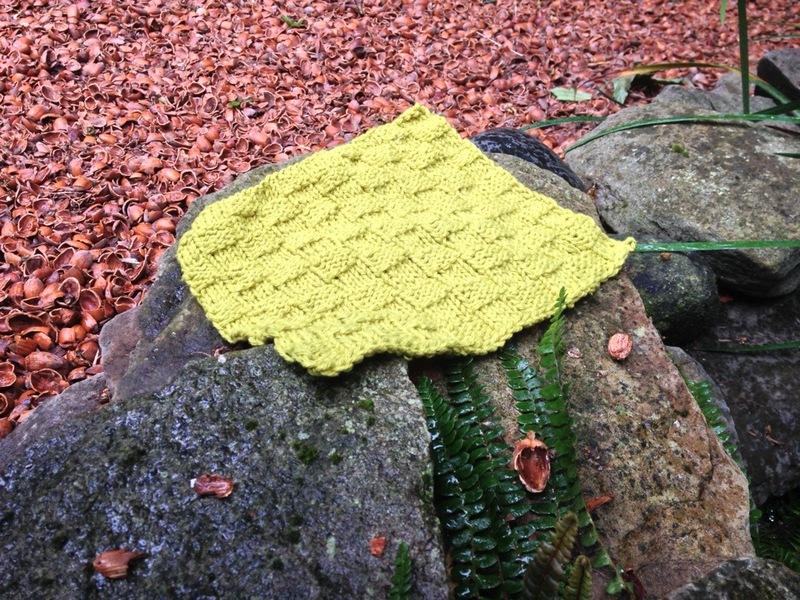 Dishcloths are the the best summer family playground knitting. I discovered this last summer and now travel with a small stock of cheery colors since the only cotton yarn I could find within walking distance last holiday was in x-mas colors. (and the red bleeds in the sink!). The benefits of the dishcloth are its pocket sized appeal, simplicity, and indestructible nature. You pause before you toss your alpaca lacework in the wood chips and risk a miss catching the boy who suddenly leaps off the top of the rock. Dishcloths fulfill my fidgety fingers without resulting in more skinned knees. You can also leave them with your host as a thank you, if your home drawer is well supplied. They’re also a perfect practice piece when you meet young knitters. Dishcloth with the help of V. who practiced her purling! 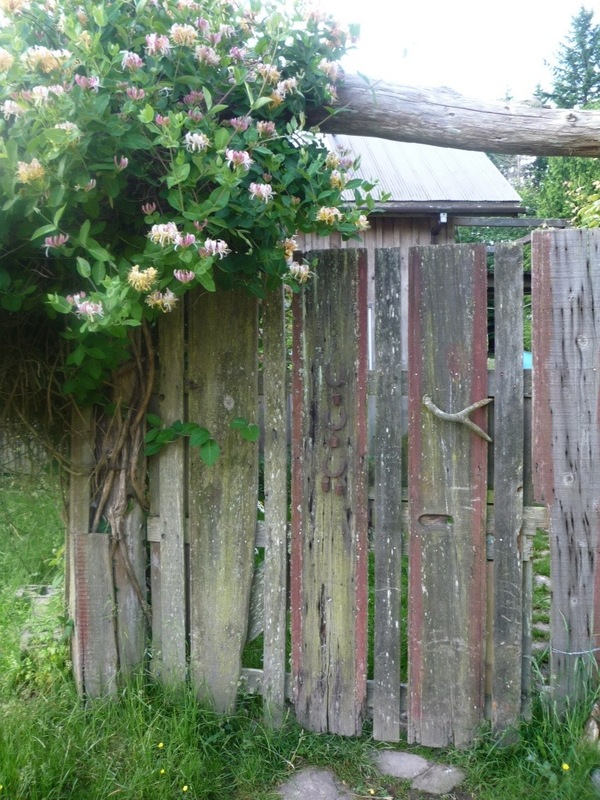 When we walk in the back gate, the smell is divine. Summer is well and truly here. My lovely new wheel has made it to the island. It has been identified as a Ferdinand Vezina built in 1877, an even hundred years older than I. The flyer is out for repairs so I have to wait to take her for a spin. I will be knitting to stay patient. 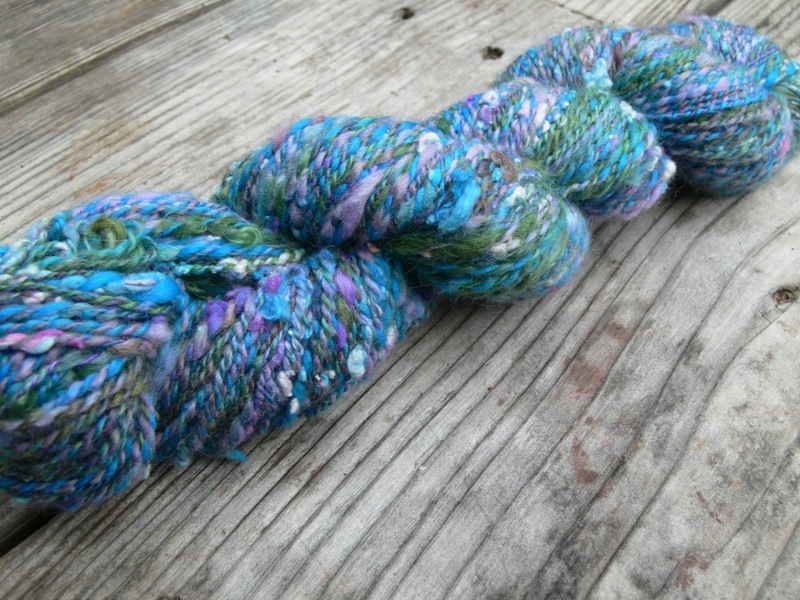 I enjoy spinning so much the yarn starts to pile up. I’m dreaming up a vest for me. If they weren’t so fun to watch……..when we leave the doors open in the nice weather, they pop inside to see what lunch the boys have dropped on the floor. Soon, they’ll be begging like puppies. 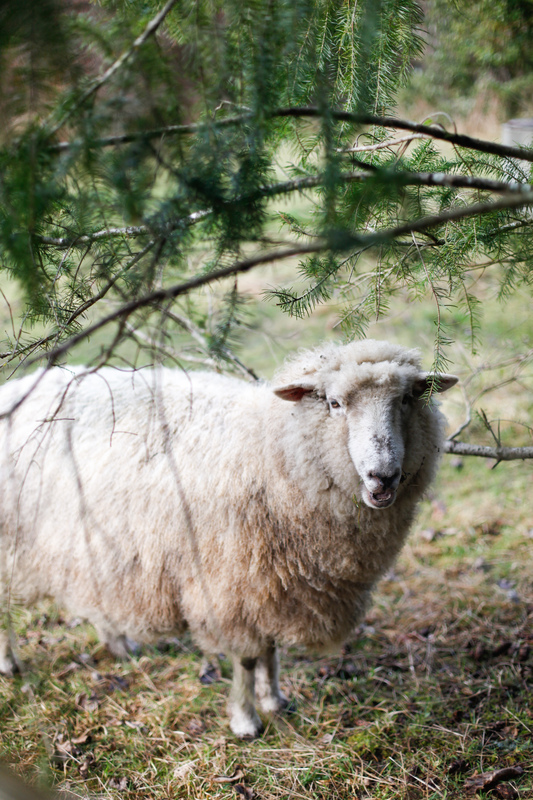 In other news, the sheep have been sheared……more wool to play with. 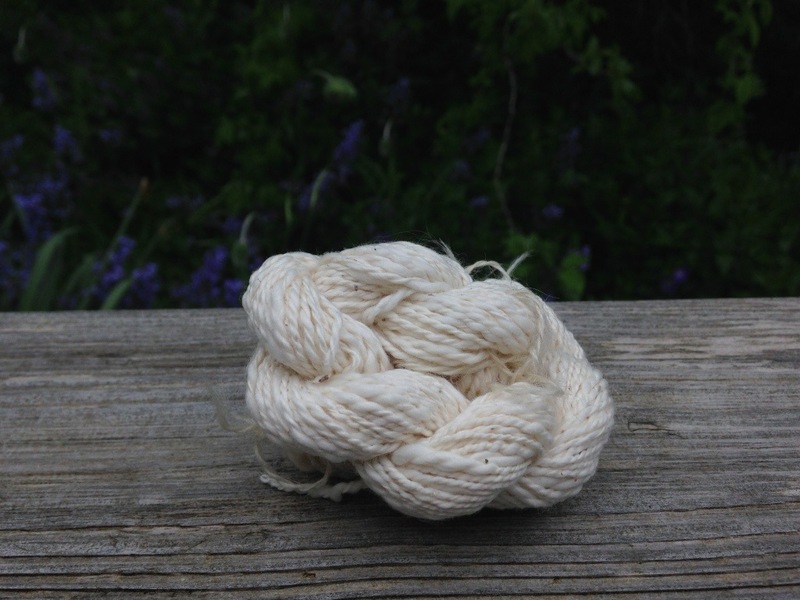 I’ve had my first success in spinning cotton. 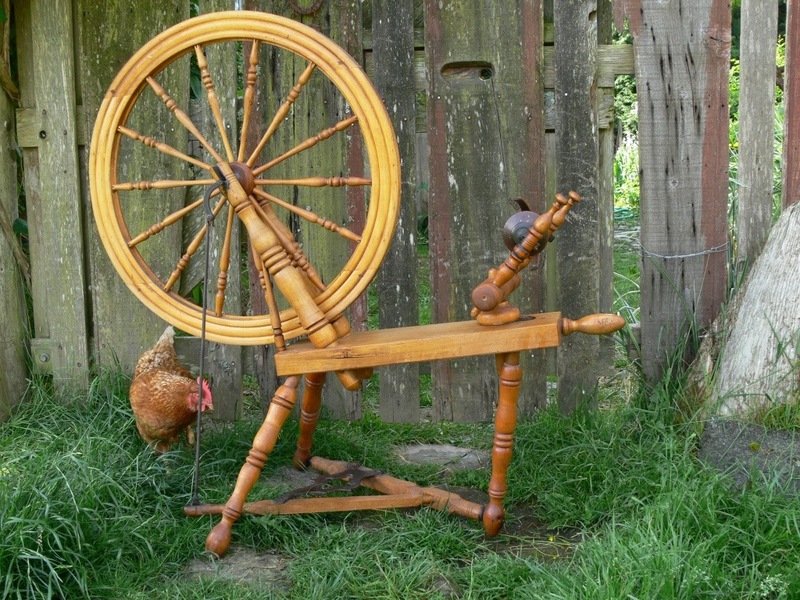 And I’m picking up an antique Canadian spinning wheel on Monday.